The morning session began with announcements about side events happening at the COP8 and also at the Community Taba. Adalbert Eledui asked a question regarding the messages we should bring to the side events. The facilitators asked the community to start clarifying the message for business and biodiversity day. They emphasized that this would be the day that the Taba can be very closely linked with the discussions taking place in the COP8 regarding especially article 8j relating to traditional knowledge and related provisions to the CBD. Esther then asked for at least 2 volunteers to work on the topic of biodiversity & protected area from the previous day. These volunteers would be working towards generating four key messages. Another two volunteers would then need to work with key messages from the business and biodiversity day. The knowledge teams will distribute paper copies of the daily journals in order to help with this process. Livingston, Willie & Kevin will work with Claire on the previous’ day issue of protected areas management. Ratu was then selected for the following day. Willie then asked for summaries from each previous day, in order to give feedback. The community then recapped some of the important themes from the previous day. Eledui expressed his concern regarding the use of the available time. He insisted that we need to keep a critical number of people each morning to participate at the Taba. Some of the response to his concern was pointing out the fact that the COP8 review process is so important that the communities voices needs to be included as well. Greater linkages and synergies need to be created in between these meetings. Ratu then official opened the morning presentation with Fijian prayer with which Fijian community meetings are traditionally opened. The first presentation was by VITALIANO SARABIA, representing the community association of UNOCACA, which specializes in the production of certified organic cocoa and coffee. They own and work on a space of 5000 ha, representing 1% of peasants who produce cacao and 2% of organics in Ecuador. They mainly export to France, and the ensuing profits have vastly improved their livelihoods, especially since they do not use intermediaries to export their products. Vitaliano mentioned that in a previous community dialogue space (Community Commons at Fordham University) he has been able to learn much regarding maintaining biodiversity and improving livelihoods. He has been able to enact to his community what he learned. He also mentioned how much he is learning from this dialogue space. For instance, the previous day, he learned from Livingstone’s presentation on the South African experience how others had to defend and reclaim their land. He gave details on how his association’s organic production actually helps enrich biodiversity. They have weaknesses however. He explained that the ministry of environment is not really seeking to defend the environment. Furthermore, there are multinationals more interested in profit than the communities. Although these are based far away, their influence brings a lot of problems, such as contaminating rivers and the soil. The goal of his association is to unite with producers from other countries and continents who have same goals of biodiversity preservation. They must join their messages and put them into practice. Therefore, it is essentially to bring back what everybody is learning here to the communities. He stressed that communities would not be able to have as far-reaching effects if they did not have the needed support here. He pointed out that organic production is rather difficult to do, yet it will save the world. Vitaliano closed his presentation by thanking the people who enabled him to participate in this meeting. The floor was then opened for questions. Ricardo asked if Vitaliano could explain more the process of translating capitalistic profit-making business to preserving biodiversity. Vitaliano answered by explaining that at first the association was only working only for profit, he then began to understand that life is more important (particularly through the Fordham meetings). As a consequence, they choose not to use any chemicals in their production. Eledui then asked what can be some recommendations that Vitaliano can share with the group regarding protecting biodiversity while simultaneously providing socioeconomic benefits to the residents. He further asked for clarification on the transfer of technology, and/or any policies that prevent transfer of their goods and knowledge to other producers. This info on transfer should be well documented, as it is a major part of benefit sharing. Vitaliano explained that they produce the best cacao in Ecuador, and they are the only organic producers with a first class quality. They are secondly engaged in protecting biodiversity. This information is disseminated throughout Ecuador in 5 provinces, 17 orgs in total. UNOCACA has trained them all. Other communities have copied their system as well. Some 30-40 people have come to visit from other regions. However, the association lacks the resources to expand this learning portion of their work (as most of profit goes directly to producer). Eledui inquired on how much of the profits are appropriated to rehabilitation or environmental education. Vitaliano explained that the exportation system of cacao is expensive (fees, taxes, cost of management & exportation). The rest goes directly to producers, and part to programs designed to improve the production system. The next presenter was Barbara Schmal, from the Women’s Project in the Brazilian Amazon. She is engaged in the municipality of Silves, which is the size of Switzerland. The organization, founded in 1999 was a result of the realization that traditional knowledge was getting lost and the organization of the local women around this cause. They worked mainly with cosmetics since they thought it would be easier to reach local and international markets. However, in 2003, they found out that they were not able to pay the producers. Therefore, they founded a cooperative AVIVA which encompasses 47 socias or societies. They work mainly with youth, women, and the handicaps who help make the packaging. This process has been very empowering for the women; before, they were apprehensive of traveling or speaking in public, but now they have attended business conferences and gained a lot of confidence. Their products are seasonal, which is the reason their products are a little bit expensive. They produce and sell candles, soaps, incense (with medicinal value), and so forth. Their objective is to generate income for women, with conservation in mind. They further wish to involve men in the latter stages. They have tried to incorporate traditional knowledge by asking the elders of the community regarding scents and so forth. This was not an easy task as they elders were not always willing to share their knowledge. One of the elderly ladies in the community has allowed them to use her knowledge of seeds and oils, and wants her technology patented. They have faced some challenges regarding authorization from the ministry of environment. Land ownership is also an issue since the land is owned by the state. The association proposed that government policies be revised in order to allow farmers to own land. The association was a winner of the Equator Prize. After the presentation ended, the floor was opened to questions. Isabella asked regarding ownership of the university labs they use for synthesizing their products. 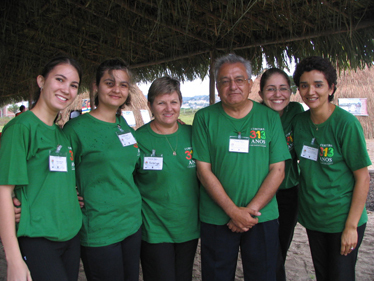 Barbara explained that they work in partnership with NGOs, mainly Friends of Earth in Sao Paulo. After this, the community was dispersed in breakout groups for discussions. restricted from hunting, harvesting lumber and were forced to generate income extra-legally. During this period it was also necessary to work through a middle man, an intermediary party. Over-extraction was too often the norm. The group began to organize itself with a professor from Sao Paolo and a technician who would eventually go on to lead the charge of the natural reserve. He suggested the community breed and grow the oysters. The model was a success and spread to other communities. Organization began to meet large demands. It was decided that a body was needed to get rid of the middlemen. The first idea was the creation of a micro company, but it we was decided that this might be exploited by outside interests. Then moved on to consider the idea of common ownership by way of a cooperative. The idea took off and was launched in 1997. This was cause to create a reserve for the Mandira community. Oysters were removed from the mangroves and taken to a nursery where they were grown and raised for three to six months, depending on market demand. It was expressed that the practice provides guarantees for future generations of sustainable oyster populations. The work of the coop has been important for the community. It has helped to develop funds to build and construct houses without dependence on third parties. Funds have been earmarked for the training of women and youth in sewing and craftwork and the project has been used as a foundation for ecotourism. Cooperative members work from production through the sale of oysters. Pride in the initiative attracts people from neighbouring provinces interested in replicating the project. The importance of putting oysters in the nurseries is to control the shape and growth. When the oysters are in the nursery the appearance is better and they are more appealing for sale on the market. This also keeps them within regulation to adhere to government laws. The second presentation was by a representative from IUCN. Biodiversity is worth billions of dollars. At the same time, people recognize that the poor are the stewards of the environment. Valuing biodiversity is more important than valuation of biodiversity. This is an important distinction. The difficulty is that you have an environmental argument to conserve. You also have the economic argument that says you need to use your resource. How do you recognize the potential of biodiversity? The reason there is a mismatch between the two is the formal and informal system that are not meeting one another. There is a need to develop markets for biodiversity. The speaker noted that it was important to give all recognition for the work they have accomplished. The speaker emphasized the important using bio-diversity in a way that it is responsible. It is not as much about research methodologies, as it is about livelihoods and development. The first reaction was to protect biodiversity, but this should not restrict access to biodiversity and local population. The benefits will comes from prospecting as communities are utilizing natural resources and adding value. With this of course arise issues of bio-piracy. A question was raised regarding how to move access and benefit sharing back to communities and nations. The speaker shared a few examples where he believes prospecting has succeeded. The reason is that people are looking outside communities, seeking funds and so forth. However, the key is to provide value-added goods and services from bio-diversity. How can you find a market for the product you are trying to develop? People try to develop products and then look for markets. We should, however, first find a market and find a demand. One must understand the market dynamics first. Much community-based prospecting work needs to be done on a sustainable basis. Products must first be sustainable. Quality and Quantity of supply are important. Many prospecting activities do not consider this from the beginning. Most organization usually only think of export markets, but this is not always the best approach. Domestic demand can sometimes be better than export markets, as export markets are tied to so many political issues (although they do offer a good venue for resources). The last issue is that too often the chosen activities are labor intensive. The final presentation was made by a Natura representative involved in food based and medicine based products. They have found that this is the best way to link traditional practices and products. The product is successful because it takes into consideration social, cultural and economic values. 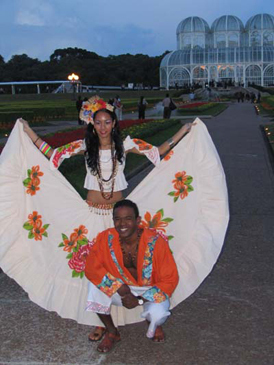 They have formed links with the environment and promotion of the sustainable use of Brazil's rich cultural and natural biodiversity. They have further been able to minimize environmental impact at the operational level and involve communities in the process. Cultural knowledge is incorporated into the production landscape. The speaker said that it is important to ensure that benefits go to communities first. One must look at how to work from local to national levels. He further advised not to look at conservation as an environmental issue, but rather as a social one, since protected areas have serious impacts on people. We must balance conservation, income-generation, and benefit sharing. There is recognition emerging of the value and feasibility of community management of protected areas. He pointed out that we are entering a new phase where there are now very strong requirements and demands on communities: monitoring and evaluation. He referred to a "shifting of the goal posts." Too often governments focus on successes rather than adversities or failures. It is necessary to learn from mistakes and from what is not working. The afternoon session concluded on these notes.